With the new Steve Jobs movie release less than a month away, a new trailer gives us closer look at Michael Fassbender's performance of Jobs himself with all of the dramatic nature of the first trailer. The film has already seen its world premiere at the Telluride Film Festival, where it garnered very positive reviews from critics, as well as Steve Wozniak, who said he felt like he "was actually watching Steve Jobs and the others, not actors playing them." Starring Seth Rogen as Wozniak, alongside Fassbender, Jeff Daniels and Kate Winslet, the film is penned by Andy Sorkin, with Danny Boyle in the director's helm. 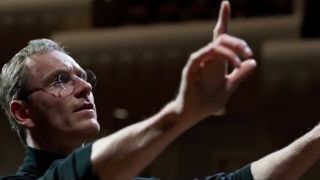 The new trailer begins with Fassbender as Jobs saying: "What if a computer was a beautiful object? Something you wanted to look at and have in your home. And what if instead of being in the right hands, we put it in everyone's hands." From there we see him and his emotional journey through the three big moments of his career that the film focuses on - the 1984 launch of the Macintosh, NeXT in 1988 and the iMac in 1998. The film is due to hit cinemas in the US on October 9, and the UK on November 13.